The Pacific Tree Frog is one of the smallest amphibians in the West coast of North America. It belongs to the Hylidae family. This amphibian can easily be distinguished from other frogs, because of its toe-pads. It is the most commonly heard frog in its native region. Northern Pacific Tree Frog (Pseudacris regilla regilla). 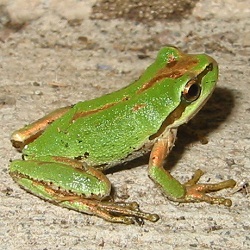 Sierran Tree Frog (Pseudacris regilla sierra). Baja California Tree Frog (Pseudacris regilla hypochondria). 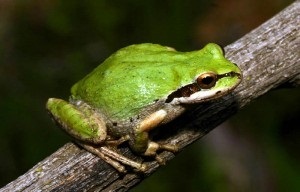 The Pacific Tree Frog is somewhere between 3 – 4cm long. It has various kinds of markings and spots on its back. There are small bumps on the upper side of its body. It has relatively long and slender legs, in comparison with the size of their body. Males have a dark patch on its throat. At the bottom of each toe, there is a rounded sticky pad, which helps them to stick to plants and other surfaces. The females are generally larger than the males. These frogs are primarily green and brown in color. One of the most important features of this species is that the color of their body changes according to the environment and these changes provide them a perfect camouflage. It is very hard to spot them unless they move. Previously it was thought that these frogs can be either brown or green. Now, researchers have found that an adult pacific tree frog can be cream, reddish cream or reddish brown in color as well. The color shades changes from dark to light and vice versa. The underside of their body is creamy white in color. Pacific Tree Frogs are primarily found in the West Coast of North America that includes Oregon, Washington, British Colombia and California. Eastwards it is found in Montana, Idaho and Nevada. It is also found in some parts of Mexico, Canada and Alaska. Pacific Tree Frog can be found in various kinds of habitat that includes forests, semi wild forests, woodlands, grasslands and pastures. At times, they can also be spotted near streams, agricultural regions and residential areas. In spite of being a fine climber of trees, they prefer to stay around shrubs and grasses near water-bodies. They spend their time in hiding under rocks, tall grasses, leaf litter etc. During the cold season, these frogs are known to hibernate in burrows of small animals or in dense vegetation. This species is primarily a nocturnal and territorial animal. During the mating season, they gather in large numbers near the breeding pools. These carnivorous frogs primarily feed at night. But during the breeding season, they feed throughout the day. Their diet includes flies, ants, mosquitoes, beetles and small spiders. They use their long sticky tongue to capture flying insects. Pacific Tree Frogs become reproductively mature within 18 months. Their breeding season starts around November and continues till June-July. The time of breeding depends on the weather and the location. The male frogs move to breeding locations and calls to attract the females. The males call both from inside and outside the water. During this time, the males fight with other males over females. The female frogs generally lay eggs in shallow and calm water. They lay around 450 – 800 eggs in small and irregular clusters, which are generally attached to vegetation. 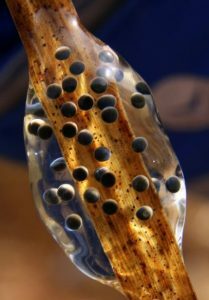 Each cluster consists of 10 – 70 eggs. The eggs are UV-B radiation resistant and can also survive slightly acidic water. The eggs are also known to survive slightly cold weather for a short period. Eggs hatch within 2 – 3 weeks. The brown colored tadpoles have a long round shaped body and reach around 2 inches in length. The underside of its body is white. They feed on plants, small twigs, protozoa, algae and bacteria. The metamorphosis of the tadpoles takes 2 – 3 months and then the juveniles move to their natural habitat. Male Pacific Frogs produce a diphasic call that sounds like “krrek..eek”. Their calls are usually heard at evening and night. During the breeding season, the male frogs call in large numbers creating a chorus. Generally a single male starts to call, which is followed by other males. In its natural habitat, this species is known to live around 3 – 6 years. Their predators include snakes, herons, raccoons, american bullfrog, birds, american mink and many other small reptiles and mammals. These frogs are very popular as pets, but anyone who wants to keep this species in the aquarium, must acquire a license from the concerned department of the government. Permissions are generally given to universities and other research centers. This species can be kept in a large aquarium. Provide them a few inches of water along with dry area beside. It will be better if you add some small plants and twigs inside the aquarium. It gives them an environment that looks like their natural habitat. To make it look better, add small pebbles at the bottom of the aquarium. The temperature of the aquarium needs to be around 45 to 60 degrees Fahrenheit. The humidity level must be around 70% – 75%. Feed the frogs with silkworms, butter-worms, earthworms, meal-worms, crickets or any other small feeder insects. 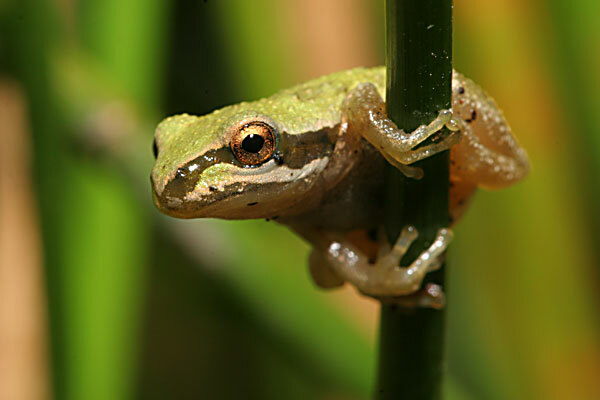 In 2007, Pacific Chorus Frog was named as the state frog for the state of Washington (USA). Researchers are studying on the sticky feature on their toe, so that they can come up with new technology for tires. Native Americans believe that each frog of this species co-exists for each human being on earth. Therefore, they show great respect for this animal. Like most of the amphibians, the disappearance these frogs indicate pollution in the environment. The call of these frogs is widely used in Hollywood movies as a night time background sound. Their skin holds salmonella. So try not to hold them with bare hands. Pacific Tree Frog is easy to spot in its natural habitat. Because of the changes in the environment and poor water quality, its population is in decline in few places. Until now, these frogs are not listed among threatened or endangered species. It is considered least concerned. Who ever is reading this, if you know anything about tiny pacific tree frogs,please let me know any facts about them please!!!!!!!!!!!!! i’m assuming you want feeding info, the little guys in the younger stages of adulthood like small worms especially. but i have found small house flies to work just as well. make sure to put a couple fake plants in the tank with them so they have somewhere to hide comfortably. How do I get rid of them? There in a neighbors yard and keep me up all night!!! Well then you shouldn’t have moved in to a place next door from where they live. They are a miracle of nature and are likely soon to be under threat because of humans killing them, mostly through pollution and habitat destruction. Consider it a blessing that they want to live near YOU; it says something about the relative low-pollution levels of the environment around your home. Get earplugs. They also eat insects that you would consider pests. I have them colonize my gardens every year from the pond and they provide the most wonderful free service, with no other forms of pest control needed (not to mention countless amazing photo opportunities). I have pacific tree frogs that live in my house freely. They came in on their own and they love my house plants and I put a small water fountain (house size) in for them. I buy crickets and they eat them from my hand. They are both female (don’t croak) and one has lived her for 7 years – amazing!!! I named her Lady Gaga. She is a morph with a very distinct reddish coloring. Love these little guys. Did I say came in on their own and do not live in a glass house. Omg I have the same!! Came in on his own and lived with me for 7 months. Has his favorite spots and seems to remember them! I just moved and was concerned mine won’t find food here! Thank you I will try to feed him a cricket! That is also how I learned to love Pacifics. They lived freely in my house and I made a kitchen pond and they would eat from my hand. They will blink to you in greeting and love it if you imitate their throat movements. One hopped into my living room and went dormant behind my couch. After rehydrating him (with tap water because at the time i didnt know any better), cleaning the carpet fibers off and placing him in muddy tupperware, we decided we were in love with him. We bought a ten gallon terrarium and a heat free uv lamp. (turns out northern pacific variety dont really need it) he loves the leafy perch I found for him, but this morning he turned a darker color and began croaking. We are in early mating season so he may just be lonely, but assuming the baby crickets we put into his cage are not what he wants, i went to the pet store and bought a variety of worms and bugs. I have only had him less than a week and have sunk considerable money into his care. If it turns out captivity is too streasful for him Im not adverse to setting him free, but I think with proper care he may be happy with us. I am just trying to see what works best for him. That may mean letting him go, but I will give it a couple more days and inform you all how it goes. Any constructive comments or advice is welcome.